Being a college student is expensive. The first big expense that impacts your finances is tuition. Then, you have grocery and general living costs. Although there are ways to save money in college on almost all of these categories. But, aside from that, one of the biggest expenses you’ll come across as a college student is textbooks. According to The College Board, students spend about $1200 a year on books and supplies for class! That’s a pretty substantial amount. And, more than any struggling college student wants, or can afford to pay. In fact, a survey from Student Public Interest Research Groups found that 7 in 10 students did not buy a textbook at least once because the cost was just too high. After all, who wants to pay over $1000 for books that are never going to be used again after graduation? Well, the key is to know where to look for your textbooks. 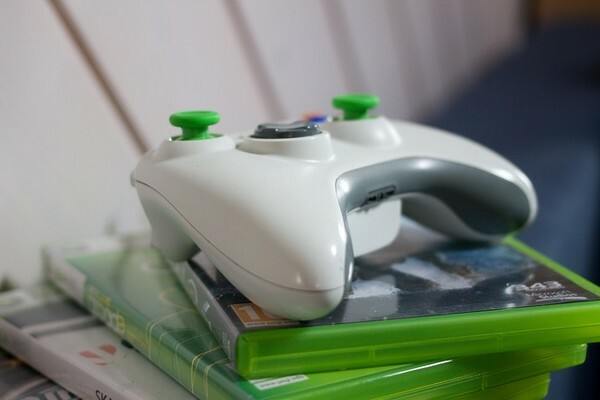 College textbooks don’t have to cost you a fortune. You just need to know which places offer cheap college textbooks. Fortunately, we’ve saved you the time and effort of trawling the internet yourself and have gathered a list of places to get the best deals. Arguably, Amazon is the best place to find college textbooks at reasonable prices. When you shop through the platform, you can ensure that you never pay full price for a textbook again! Not only does Amazon offer low prices on textbooks, but it also provides a really extensive selection. So, no matter what courses you’re taking, you’re sure to find the book you need on there. Through Amazon, you have the option to buy both used and new books and rent them too. So, it’s a really diverse place to find cheap college textbooks. You can save up to 80% on rental, new and used textbooks, as well as eTextbooks, which is a pretty great deal. You can also trade in used textbooks for Amazon gift cards, even if you bought the books elsewhere. For new textbooks, you can get them at up to 20% off, you can save up to 70% on textbook rentals, and you can save up to 80% on used textbooks. Plus, if you’re already a member of Prime Student, you get free two-day shipping on many of the site’s textbooks. If, you’re not a member of Prime Student, then you really should consider signing up. Students pay 50% less than others for a Prime membership. So, it only costs you about $4 per month, and you get free shipping, as well as access to tons of movies, music and other benefits. The fact that it also offers eTextbooks is really useful if you don’t want to have to worry about carrying a ton of books around campus with you. Whether you’re studying arts or engineering, Amazon has your textbook needs covered for any subject. Another really great place to get cheap textbooks is at Chegg. Unlike Amazon, which allows you to buy textbooks, Chegg focuses solely on textbook rentals. So, if you’re searching for a textbook that you’re only going to use for a short period, then you should definitely check out this platform. After all, if you don’t really need a book for a long time, then it’s often better to rent it instead. Also, you don’t have to deal with selling or storing your textbooks after you finish using them. Chegg offers really great prices. You can save up to 90% on textbooks rentals. All you need to do is visit the site, find the textbooks you need, and, then pay the one-time rental price for each book. Then, the site ships your books right to your door. You can return the book when you’re done with it. All you need to do is visit the site, and print out the shipping label for the books you want to send back. You also have the option to purchase the book later. So, shop at Chegg and use the money you’d otherwise have spent on books on something more fun or more useful in the long run. Unlike the two platforms above, BIGWORDS doesn’t sell textbooks directly. Instead, it works as a search engine and comparison tool for textbooks. Using it, you can compare prices from all of the best online stores at once. BIGWORDS compares prices of new, used and rental textbooks, saving you a lot of time, and ensuring that you get the best deal! It makes finding the textbooks you need at the best prices so much easier. Essentially, all you need to do is type in the name of the textbook you need. Then, you’re presented with a list of different retailers that offer this book, along with the cost of each. When you use BIGWORDS to find books, you’ll probably end up buying textbooks through a number of different retailers. This might take a bit more time, but you’re sure to get the best prices this way. According to the site, you can save up to 90% on books when you use the platform. What’s great about BIGWORDS is that it also facilitates the sale of textbooks too. So, if when you’re done with your textbooks you decide that you want to sell them, you can through the platform. You can even adjust your search for shipping costs, and compare the price of both purchase and rental books. So, you can buy the books that you need to keep at their lowest prices, and rent others. AbeBooks is another excellent place to find new and used college textbooks at really affordable prices. Founded in 1997, AbeBooks is one of the most well-established and reputable platforms for buying cheap college textbooks. Amazingly, you can save anywhere between 50% and 90% on textbook list prices. One of the best aspects of the platform is the diverse range of books it offers. There are tons of new and used textbooks available for almost all subjects, and you can also find a vast selection of reference books, scholarly books, academic journals and classic literature on the site. All you need to do is search for the book you want, by ISBN, and you’ll see a huge list of books at low prices. And, the best part of buying your college textbooks through AbeBooks is that you can actually get free worldwide shipping on many of them! The site actually allows you to search for books with free shipping in whatever country you’re in. Another great thing about AbeBooks is that it offers a textbook buyback service, which it works with TextbookRush.com to provide. All you need to do is visit this page and then enter the ISBNs of the books you want to sell in the box. Then, you can find how much the site will pay for them. It’s a great way to make some cash from stuff you no longer need. AbeBooks really does offer some of the most generous prices on its books, so if you want to get books at a highly discounted price, then it’s definitely the site to check out. Half.com is an eBay owned platform, specializing in music, movies, games and, of course, textbooks. It’s a popular place for college textbooks and with good reason. On the site, you can buy and rent college textbooks at very affordable prices, and you often get free shipping as well. There’s an excellent selection of both new and used books. So it’s easy to find what you’re looking for on the site, no matter what subject you’re studying. Plus, you can set up your own wish list to help you to keep track of the books that you need to buy. You can also sell textbooks through the site. So, if you’ve got some old textbooks you no longer need, then you can make some cash from them. It’s easy to find the books you need on the site, too, as you simply need to search by ISBN number. DealOz does not sell textbooks directly, but like BIGWORDS, it’s an excellent tool for finding the lowest prices for them. Essentially, it’s a search engine and comparison tool that allows you to search for new and used textbooks. Like with BIGWORDS, you enter the name of the textbook you’re looking for, and you get a list of books from different sellers. Through the site, you can easily compare prices for textbooks from more than 200 online stores at once. This saves you so much time searching through sites yourself, and it’s a good way to guarantee that you get the best price on each book. According to the site, you can find books at up to 97% off. So, if you’re after a book in particular, then it’s worth doing a quick search for it on this platform. Did you know that you could save up to 90% on your college textbooks if you buy them through Textbooks.com? Textbooks.com is a website that sells new and used textbooks. You can even find eTextbooks on there, which is ideal if you don’t want to carry a lot of books around campus with you. 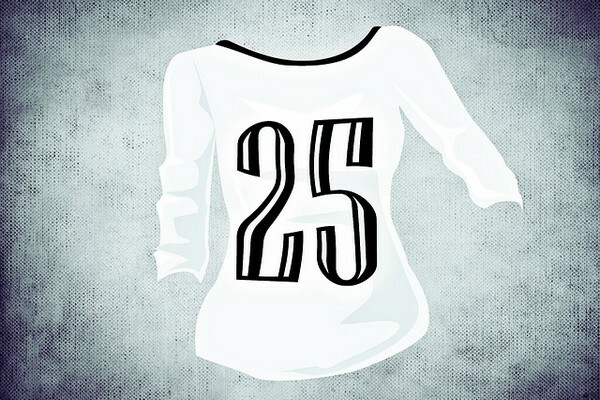 The website gives you free shipping on orders over $25. There’s a pretty wide selection of books on there, so you’re likely to find the one you’re looking for, regardless of what subject you’re studying. Handily enough, Textbook.com gives you 30 days to return books, hassle free and it has a total satisfaction guarantee. You can also sell books through the site. And, it doesn’t matter where you bought them. Plus, shipping them to the site is free. So, if you’ve got any textbooks you don’t need anymore, then it’s a good place to sell them. It’s really easy to do as well. Another pretty useful aspect of Textbooks.com is that if offers you cashback on certain books at the end of the semester. If you buy one of the site’s Guaranteed Cash Back books, then you’ll get 50% of your spending back. Another site that offers cheap college textbooks is Campus Book rentals. It specializes solely in textbook rentals. So, if you don’t want to purchase a particular textbook, then it’s a great place to shop. Plus, the site encourages you to treat the textbooks that you rent from it as your own. Another great aspect of Campus Book Rentals is its free shipping. This can save you quite a bit of cash each semester. Also, with Campus Book Renter, you can also rent any textbooks that you do own to other students on the site. So, it’s a wonderful way to get some cash and use out of the textbooks that you no longer need. It’s definitely a site that’s worth checking out if you want to rent your textbooks at a low cost. Like Chegg, Book Renter, as its name suggests, specializes in textbook rentals. So, if you don’t feel like buying a book is really worth it and you’d rather rent it instead, then this is the site for you. All you need to do is search for the textbooks you want, decide how long you’d like to rent them for, and then place your order. A great aspect of Book Renter is that when you rent textbooks, they ship for free! If you decide that you want to keep a certain textbook for longer, then you can simply extend your rental. When it is time to return your book, all you need to do is print the pre-paid label that the site provides and drop your textbooks off at any UPS, USPS or FedEx location. According to Book Renter, you can save up to 90% on your college textbooks when you buy them through the site. But, unlike some other textbook rental sites, like Chegg and Campus Book Rentals, at Book Renter you can also buy used books too. All you need to do is enter the ISBN number of each book that you want to buy on this page, and you are presented with a plethora of low-cost options. So, the options on the site are super diverse. There are more than 5 million college textbooks available on Book Renter. So, no matter what subject you’re studying, you’re sure to find the book you need on the site. Find new and used college textbooks for sale at Better World Books. This unique website sells a plethora of college textbooks and books and donates a portion of all sales to fund global literacy and libraries. That’s pretty awesome. There are more than 8 million titles to choose from. And, even the site’s used books are in great condition. One of the best things about Better World Books is that you get free shipping on all orders. So, even if you only need one textbook from the site, then you’ll still get free shipping. Looking for places to get cheap college textbooks? Then check out eCampus. Through this handy platform, you can find a huge range of new and used textbooks to buy, and rent. According to eCampus, you get save up to 90% on textbook rentals, eTextbooks, and used and new textbooks. You can extend your rental at any time, and if you decide that you want to keep it, then you can purchase it at any time. Also, if you decide that you no longer want your textbook for any reason, then you can return it within 25 days of purchase. Shipping is free on orders that are more than $59. 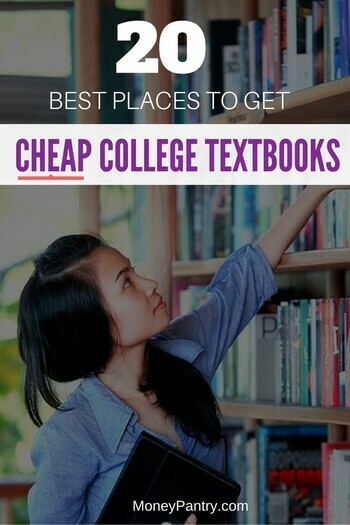 If you want a good selection of cheap college textbooks to choose from, then it’s definitely worth taking a look at Affordabook.com. Like DealOz, Affordabook is a textbook comparison tool, which lets you search and compare college textbooks from a range of different stores. With this tool, you can easily find the best deals on textbooks. It not only saves you money, but Affordabook also saves you the time of having to search online stores yourself to find the best prices. Another really great feature of Affordabook is the Watched List. Using this feature, you can set up alerts for the books that you’re interested in. When your chosen book meets your target price, you get an email alert, along with a link to purchase the book. ValoreBooks is a great place to find cheap college textbooks. Through the site, you can find a plethora of really inexpensive used books. Also, if buying a book isn’t the right option for you, then you can rent it instead through ValoreBooks. Plus, there’s a 30-day money back guarantee on offer. That means that if you’re not satisfied with your purchase for any reason, then you’ll get a refund – no questions asked. And, when you’re done with your books, you can actually sell them back to the platform. It’s really easy to do. All you need to do is find a price for your books on ValoreBooks, and then ship them to the site. The website provides you with a prepaid shipping label. This means that you can ship your textbooks for free! Once someone buys your textbook, you get paid by check or PayPal. You can learn more about selling your books back to the site here. BookFinder.com is a website where you can find both new and used textbooks. It’s been around since 1997, so it’s got a lot of experience. Like BIGWORDS, BookFinder.com is a comparison tool. You can use it to quickly and easily find the best prices for textbooks from more than 100,000 sellers. You can search for both new and used textbooks. Using a comparison tool like BookFinder.com makes it much easier for you to find the best price for the book. Plus, it’s so much quicker than searching for sites manually. According to BookFinder.com, if you use its comparison tool, then you can save up to 90%. Also, if you have any books that you no longer need, then you can also sell them to the site, and make a little extra cash. Did you know that you can save up to 90% on your college textbooks if you search for them using CampusBooks? CampusBooks is a comparison tool that allows you to compare the price of buying and renting college textbooks. Using this handy tool, you can search for textbooks from hundreds of retailers and sellers. So, you can ensure that you get the best price for each textbook that you buy. Also, CampusBooks has a feature that it refers to as it’s Buy vs. Rent SuperBot, which helps you to determine whether it’s cheaper to buy or rent your textbooks. This takes the guesswork out of deicing whether to buy or rent. You can also sell any textbooks that you no longer want through the site. Looking for a really good selection of college textbooks at reasonable prices? Then, check out Textbook Recycling. It’s a website that allows you to buy or sell textbooks and to compare prices for textbook across the internet. On the site, you can find traditional textbooks, as well as E-textbooks. So, if you want to keep your bag a little lighter this semester, then it’s a great place to shop. You get free shipping on the site on orders that are over $75. At Textbook Recycling, you can find both used and new books. According to the site, it tries to describe condition of all of its books accurately. And, the site states that it does not sell book that have torn or missing pages, torn covers, stuck pages or excessive highlighting or notes in them. And, if you do purchase a book, and you’re in any way not satisfied with it, then you can return it for a full refund. There’s also a really great buyback program on offer. All you need to do is enter the ISBN number of the book that you want to sell in the box on this page. Then, you’ll get an instant quote. If you do decide to sell your book through the site, then you can ship it to them for free! You get paid via check or PayPal if someone buys your book. StudentBookTrades is a website where students can trade, buy and sell college textbooks. According to StudentBookTrades, you can save up to 90% on your college textbooks when you get them through the site. The site mainly focuses on Textbook trading, but you can also buy and sell books too if you want. The process of trading books is pretty easy. You can create a wish list of books you want, and then the site will automatically match you with other students that have those books when your chosen titles become available. According to StudentBookTrades, you can save up to 90% on textbooks when you get them through the site. You can search for books you want on campus and nationwide. Another great, and unique, aspect of StudentBookTrades is its monthly giveaways. Direct Textbook is another textbook comparison website, like DealOZ and BIGWORDS. You can search for the textbooks you want on the site, and instantly compare the prices of them across hundreds of online stores. You can compare the prices of used books, as well as book rentals. On there, you can buy textbooks that are up to 75% cheaper than those you’d find at traditional bookstores. And, it also claims that rentals are generally 50% less than bookstore prices. So, you get the same books you’d find at a campus bookstore, only at a much lower price. What’s particularly interesting about Direct Textbooks is that unlike other similar platforms, it offers coupons for books. So, you can save even more money. Using Direct Textbook, you can search books from more than 200 listings. Simply enter the name of the book you want, and it instantly compares textbook prices from the best online stores, on a single page. And, alongside it, Direct Textbook lists any coupons or cashback offers that are available. You can also filter the results by ISBN, title, author, edition, format, publishing date, publisher, keywords, delivery time and even subject. At Alibris, there’s a great collection of new and used textbooks on offer, as well as music and movies. The site’s been around since 1997, so it’s experienced in the field of selling books. The site offers a great range of new textbooks. So, if you’re looking for a new edition, then it’s definitely the site to shop at. There’s also a really extensive selection of used textbooks on there too – in fact, there are millions to choose from! According to Alibris, you can save up to 80% off the list price. That’s a pretty great deal! When you’re finished with a class, and you have a textbook you no longer need, then you can sell it back to the site and get some extra spending money. And, if you decide that you don’t want to buy a particular textbook, then you can rent one instead at Alibris. You can choose to rent a book for the quarter or semester. Once you’re done with the book you can return it for free. Skyo is an online marketplace where you can find new and used college textbooks. One of the best things about Skyo is that it offers free shipping on every order. So, even if you only end up buying one book on there, your order will still qualify for free shipping. Plus, you can also buy digital textbooks on there, which you’ll be glad to hear if you’re tired of lugging a heavy bag of books around campus. There’s a pretty extensive collection of textbooks available on there, so regardless of what subject you’re studying, you’ll probably find the one you’re looking for. It’s one of the best places to buy textbooks. College is a great experience, but it can also be pretty expensive. So, check out these places to get cheap college textbooks, and your bank balance will thank you. Design T-shirts for Money: Win $2000 with Threadless? 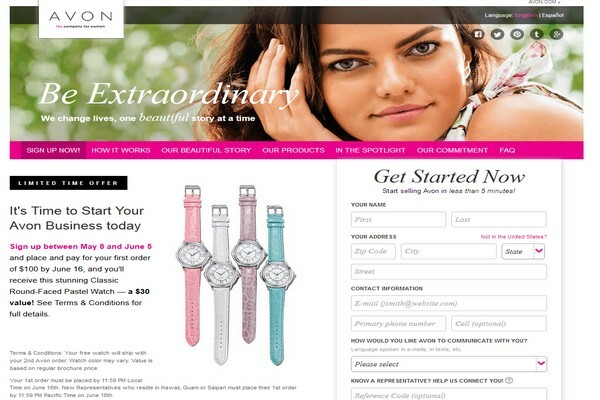 Is Selling Avon worth It: How Much Can You Make Selling Avon Products?